Roooh, the creation of Shruti Jaiswal is where tradition meets sustainable fashion. 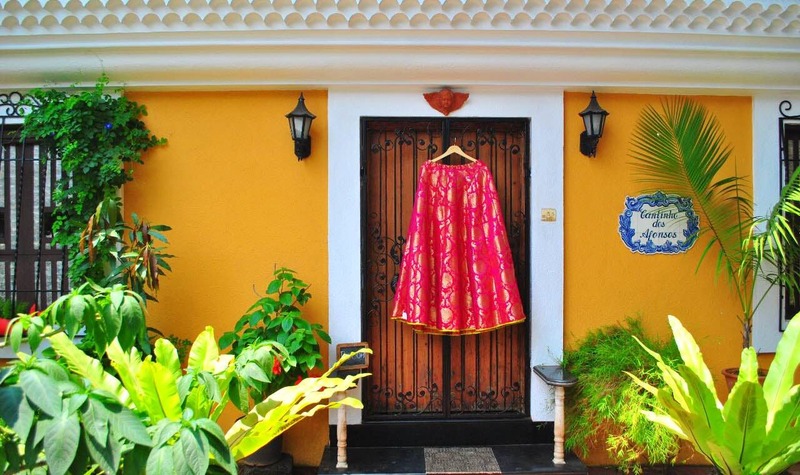 Displaying a collection of elegant ethnic wear from the lanes of Banaras for both men and women, they specialise in plush Banarasi sarees and rich, intricate hand embroidery, and stunning bridal wear. As a customer, Roooh will understand your preferences, help you conceptualise the design and weave the loom with your designs and create a saree, lehenga or a sherwani out of that for you. They will even weave a story on your fabric if you wish so. You can choose from a wide range of silk, cotton and other fabrics. They bring together 5 categories of weavers in Banaras, each specialising in techniques such as folding, pressing, twisting yarns, bleaching, and dyes. They work with more than 300 weaves such as Kattan silk, raw silk, georgette, ajrak, Bhagalpuri, linen, muga silk etc. Every order is bespoke and one of its kind. Their workshops are located in Banaras and Goa and the store is located at Miramar, Goa. They either take the order online or by appointment. Starting at INR 3,000 for a ready to wear outfit and INR 1,800 for a saree, the collection is absolutely stunning. If you are eager to check them out, they are putting up an exhibition - The Banarasi Connection at Hotel Nanutel, Margao, Goa on August 10 and August 11 (Friday and Saturday}. You can also follow them on Facebook and Pinterest.